Last year I started Guided Math and shared a few things with you all, including a checklist that I used with my students. It was a great tool and really held my students accountable. 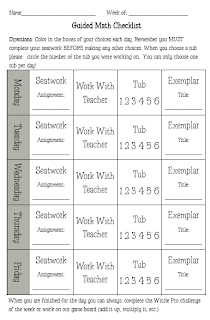 As I am about to begin letting my students run wild begin groups/centers I felt I need to streamline my checklist a little, as well as make it a little more "fifth gradish". So here are both my Guided Reading and Guided Math checklists. Click on them to download them. For math...it's pretty simple. After each mini lesson I always give them 5 to 10 questions/problems to work on at their seats, to check for understanding (that is seatwork). With with teacher...well that's pretty obvious. As part of a schoolwide initiative we are incorporating Exemplars. They will have to complete at least one a week. Finally my tubs...as you can see from the picture below I keep my different games/activities in numbered tubs. Now I don't plan to use all six of them every week. For instance this week I will use just two tubs...One: Roll A Factor game and Two: Multiplication War. As we learn other games and activities I'll add them in...maybe a few task cards here and there as well. I am going to use the little red sign to write what each tub contains in it. As for reading this week...again pretty simple. 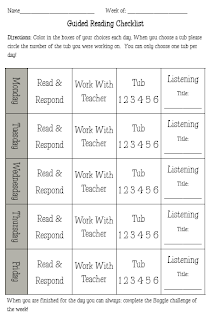 Read and respond is independent reading and writing in their journal, this must be done daily. Meet with teacher...again pretty obvious. Listening...is my listening center, I usually check books on CD out of our public library and let the students listen to the books (I have a splitter, so 2 to 6 people can listen at a time). As for the tubs...like math I will not start or use all 6 tubs each time. I think I will start with Making Words, Word Ladders, etc. I want to eventually incorporate technology as a center as well. We will see how this goes! I found mine on amazon, click on the picture for a link! A few things to know...You can't use your interactive board with this, it only projects your iPad (but the kids still think it's AWESOME!). You can project games, books (which I mostly use)...just have your apps and books already purchased and downloaded if your school is not BYOT (bring your own technology). I love that in 5th grade I can really use current events and get my students really involved in responses and even some great discussions. As part of our Writer's Workshop lesson we were looking and listening to current events, then responding to them. This was something that is used as a way to come up with other things the students can write about...you know when they say "I don't know what else to write about" or that famous "I'm finished". So I think I am always going to have a few articles and/or current newspapers in my writing center area as well as just simple pictures, that can spark some great writing. Not only did we use the articles for our writing lesson, but we also talking about the elements of text. I am HUGE on having the students mark up their reading passages. I feel that if they do this then they tend to pay closer attention to them. We start by simply marking the simple things such as Title, Headers, Captions, etc. We then get into more specifics of leaving tracks when reading: highlighting definitions, underlining important information, leaving our thoughts and questions as well! I love it when my reading and writing lessons just flow together and "make sense". In the first paragraph they had to write a summary of their article, the second paragraph was their reaction, thoughts, feelings...etc. ﻿Not too bad for our first attempt. Love the title Presidential Stuff! Also a new thing we are having to do is each class has to make and post their class promise (mission statement, constitution, whatever you want to call it). This is what my class came up with. I like the sign I made, but it is HUGE! Way too huge!!! The ceilings in my new room are very low, I feel claustrophobic with this up. So it's about to disappear and become smaller. But the kids did a great job on coming up with their promise. Conduct and work habits update: some had asked what my rewards and such were for excellent behavior or work habits. The school has these things called shields that each student can collect (little squares that say they have been caught being good). Any teacher can give them one. They in turn collect them and two things happen...one they can be picked and announced on our morning announcements (a little recognition) and then they can turn them in at the end of the month for a small thing given to them by the school (a little soda, or lollipop, or ice cream...something). In my room I give them the punches on their punch cards that they exchange for different things. I hope that helps some. The Good, The Bad, and the...well....Off Task! Here is my new positive behavior chart. Because of the new initiative I had to do away with my old checks in the folder system...eeek! That was tough to let go of. So the students start at Ready to Learn (an S, because the school feels that the students should earn an E in behavior...go above and beyond). Therefore, great job is also an S...awesome is an E. The hard part is "catching" those great students, who are always doing good things...being awesome! Now warning is an S, teacher choice is an N, and parent contact is a U. Each student has a magnet with their number on it to move up or down. Where I ran into problems (and still trying to iron out the confusion) is that a student could technically do something to move up to great job (S) but as the day progresses they could have a few behavior situations that cause them to move down...let's say two...well then they will still end up with an S because of their move up earlier in the day. Do you see what I am saying here...my intern mentioned that a student could be an angel in the morning, then trade that halo in and be a terror in the afternoon, but still go home with an S. So I am trying to work around this little problem. Now my other problem was that this is all behavior...whereas my folder system also contained work habits, which I believe is a huge component of grades and very reflective of their grades. However I couldn't get how they could combine (as they have on their passports...a whole 'nother thing in and of itself) both of the items and have a simple E, S, N, or U for the day. I ran into this problem very quickly in my classroom this year. I have oh let's say about 10 students who are my transition students (didn't pass a portion or all of the state test last year in 4th grade). Well the students (majority of them) are NOT behavior problems, they don't stand out...basically they don't want to draw attention to themselves...for a reason. They don't get it (academically)! So they are just fine with getting that S for the day..."if I just sit here, not participate, act as though I am paying attention, pretend to work, I can get an S and move on". Well not in my class! The kids also don't complete their homework, aren't really on task, and usually don't finish classwork. Again, not in my class. I want to say..."This is why you failed! ", but I don't. So for a few days I struggled with how to make this system work for me. I decided to make a second chart...a work habits chart! It is pretty straight forward, and the kids seemed to get it too. If you come with your homework done, work in class, stay on task...you get an S. If you are always participating, on task when others may not be, and just stand out...you move to E. However if you forget homework, don't participate, are not on task...you move down. The smallest move down means you get a quick note to your parents that must be signed and an N or U for the day. This is also pretty good documentation for me when I have to have kid talks and/or parent talks. So that is one of the many many many things that has been "hurting" my brain these first few days. I guess we will see how it goes! Well it's Sunday and I am working on my To Do list: laundry, grading (well checking), lesson plans, and so on. 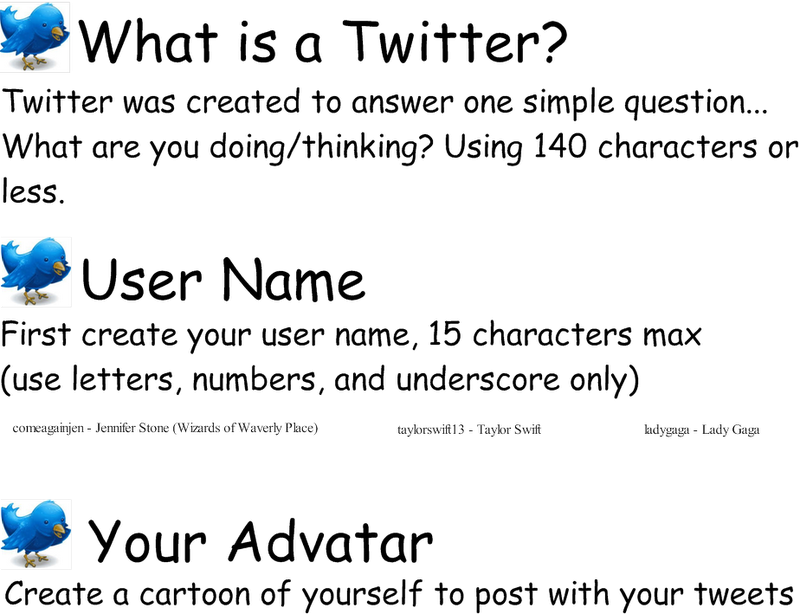 On my list was to give you all the What's In a Name worksheet that I had created and couldn't upload. 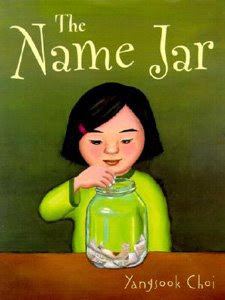 For those of you that read about our first day we completed name bubbles to get to know each other, which lead nicely into this What's In a Name activity. Someone had commented that I should have them use the bubbles and create a wordle...seriously you must know me a little too well, because that is exactly what we are going to do on our second computer lab day! I had them save their name bubbles just for that activity! However I had to wait for the second week of school until we can get into the computer labs...so stay tuned for that activity! I did want to take a quick survey...as some of you know I also write for another blog Classroom DIY. We are on our fourth month of great classroom do it yourself items. Now I am drawing a blank. I have been trying to get a few ideas from pinterest to try out, but I am still struggling. 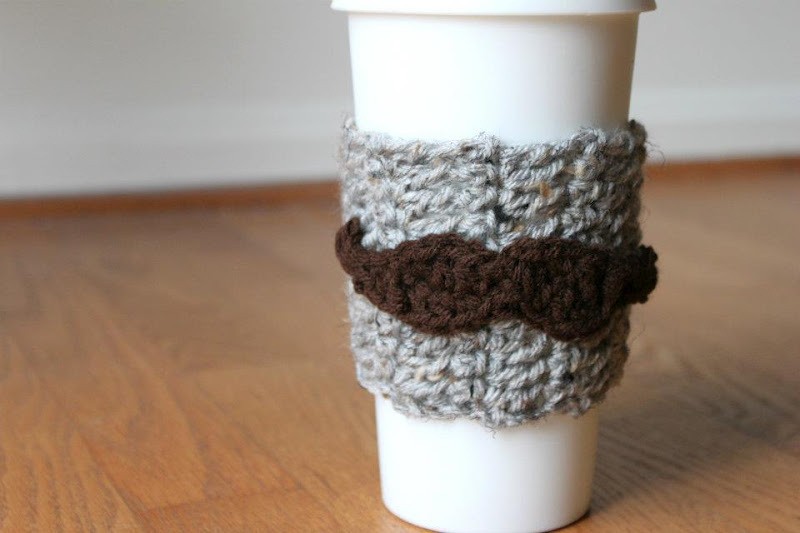 So my question to you all is what have you been wanting to try and DIY? What would you like to see made? Any suggestions would be great! Click here to get the What's In a Name WS! Oh and head over to Quite A Pear for a back to school give-a-way...so cute! Again I am exhausted...I have completed my first week back to school, and first week back in fifth grade. There were a couple of times I had to stop, blink, and think "that's right they are 5th graders"...and they are breaking me in well. I only had a few moments of panic and worry, especially when I began looking over the Science content/book to plan for next week...oh my! But I have a great co-teacher that is keeping me calm. There were a few little things I thought I would share with you from this week. 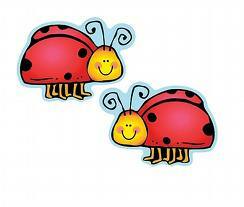 First to answer a common question: Where do you get your ladybugs to decorate your room? Well the cartoon looking ones are from DJ Inkers and I think I picked them up from The School Box. The ones that I have attached to my clothes pins and sometimes wall for decoration are from Hobby Lobby, they are painted wood and were about .49 cents each (when on sale). Another common question is how to I put things on the board and walls...I LOVE hot glue!!! Yep use it for almost everything. It comes off the board easily as well as the wall...especially if you use a paint scraper type tool. The first was a writing lesson on mini investigations. This was a county lesson plan that was a way that the students could get ideas for writing. 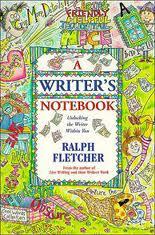 If you are familiar with Ralph Fletcher...it went along with Ch2 in his book A Writer's Notebook (GREAT book!!!! the kids love it...and it's available for your Kindle, just downloaded it!). I talked about them making a list of things they would like to "investigate". We made an I WONDER bubble in the middle of the page and completed a splash of all their "wonders". I then gave them the assignment below...What's In a Name...I had seen many versions of this and couldn't find one with all the questions I liked, so I made my own. They had to do a mini investigation and find out about their name. They loved it...the next day we shared and learned more about each other. Well I am going to have to promise to attach it later, because my computer isn't letting me. Finally we ended the week using the Scientific Method and seeing what would happen to gummy bears when put in hot water and cold water. It was a lot of fun. I also found FUN song about the Scientific Method...I dare you to listen to it and not have it stuck in your head for the rest of the night. For those of you that were wanting it, this is what my mimio looked like. I also saved it as a Adobe so that you could project it. Click here to retrieve it! 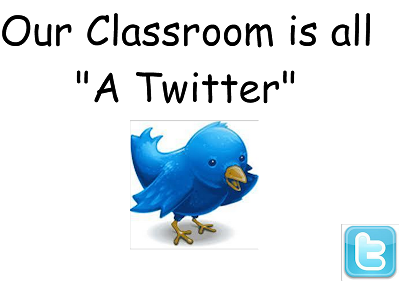 Adjustment: I allowed my students to write their own Tweet and not one for their partner....I thought they would be a little more specific and interesting. I managed to survive our/my first day in fifth grade! This year I have been given the task of teaching fifth grade and transition. For those of you that don't know what that is, I have the students who failed the fourth grade end of the year test. They had a chance to pass it in summer school, most passed a few sections, but those placed in my class still failed a portion....this is about half of my class. I tell you this just in case you see a few things posted and think, "wait I thought she was teaching 5th grade this year!" Okay so now on to our first day and what we did. The students had some board work, what we call Big 5 to complete. Big 5 is simply five math questions (and I also do 5 LA questions) that are possibly review of items we already learned or are struggling with. Seeing that it's the first day of school it was simple end of fourth grade math problems. I also wanted to give them a little something else, so I saw a few of these questions on Pinterest. They were each given six sticky notes and had to write their answers and post them, I did allow them to be anonymous if they wanted. 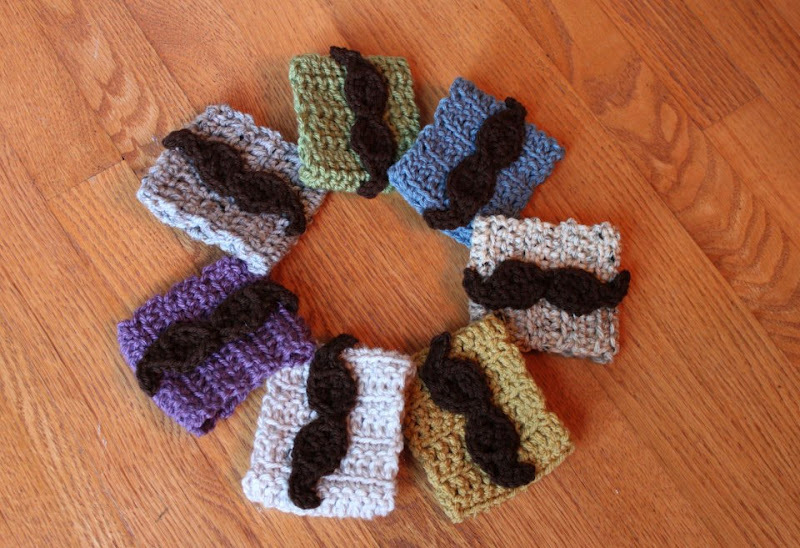 Here is what they looked like, I LOVE some of the responses, I hope you can read them! Student responses to What will you need to be successful this year? Student responses to What do you hope to learn this year in 5th grade? Student responses to Our class should be _________________ everyday. Student responses to What kind of teacher do you want? Student responses to School is important because __________________. Each student made their own name bubble. They then had to partner up and shared their bubbles with each other. Once partnered up they "introduce" their partner to the class and share at least two things about that person. 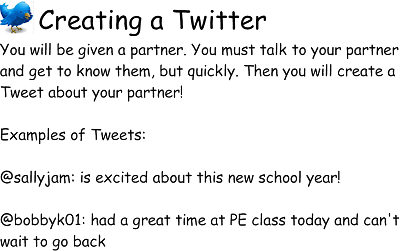 We then did a fun Twitter activity! They each got to make up their own Twitter name and draw their own avatar (I have a little mimio I made for it, I'll have to take some Hypersnaps and show it to you all later, I left my school laptop at school tonight, on purpose!). Once we had those two things completed they got to write their own Tweet, sticking with all the Twitter guidelines! Here is how they turned out. A few of you had asked how my clipboards were mounted on the wall. Just plain hooks...hot glued on the wall. That simple! Hope you first day goes as well as mine did!